As a project manager, you are required to motivate your team to perform, even without formal authority. Threats and bullying do not produce desired outcomes, generally. While these behaviors might get you what you want in the short term, you’ll get a pretty low reputation among your team. Inspire team members to want to work with you through more positive motivational ways produced better outcomes. Demonstrating coworker appreciation will get you more positive results, and create a happier workplace, in the long-run. Your Project Teams Work Hard. Show Your Appreciation. There are times when project teams have to work late and put in extra hours to meet deadlines and milestones. You may have a production push that requires weekend work. Or you may have to re-work documentation based on users changing scope or requirements (yes, it happens). Even the best-laid project plans can have surprises. The whole team is working toward success, and sometimes it’s easy for teams to feel under-appreciated. Let your team know that you’re aware of their efforts toward the ultimate positive outcome. Showing your project team members that you appreciate the effort they put forth doesn’t have to cost a lot of money – or any at all. As a project manager, I’ve not had the luxury of appreciation or celebration budgets very often, so I’ve had to rely on creativity or basic simple actions to show my appreciation to the team. But in each instance, I believe they knew that it came from my sincere gratitude. 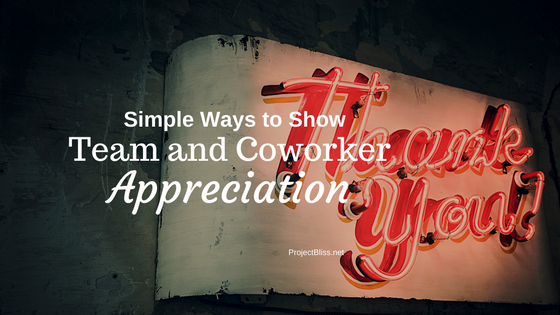 It can be hard to think of ways to show appreciation that don’t cost a lot. Scented items (soaps, candles, lotions) are either so subjective to personal taste or run the risk of being unusable to someone who has an allergy. I happen to be that co-worker who gets a throbbing headache from perfume nearby, so for me, anything with fragrance is out of the question as a gift idea. To help you think of easy and affordable ways to show your appreciation to your team, I’ve compiled a list of ideas of varying costs, starting with free. Saying “thank you” and acknowledging their work. This is likely not done frequently enough. It is one of the most important things you can do – to say “thank you.” We all work for money, but after that, we want to feel that we are part of something important and that what we do matters. A simple “thank you – your work is really important to the success of the project” goes so, so far. Letting a team member know that they were praised publicly in a meeting for work well-done. Remembering a birthday and giving a birthday card. Writing a thank you card and leaving it for the team member. Taking a co-worker for an offsite afternoon “break” of coffee or hot chocolate. Bringing in donuts at breakfast. Buying pizza for the team – and staying with them – when they must work late to meet a deadline – such as an after-hours code move-to-production. Celebrating a team member’s personal milestone, such as the birth of a child. Bringing in a masseuse for 15-minute chair massages. Team potluck cookouts at the office. Gifts of movie or event tickets. Team outings to offsite activities. Personalized notepads (they make lovely gifts and can be inexpensive). Built Neoprene Lunch Tote – spacious and flexible enough to fit odd shaped containers. I love mine! Extra charging cables are really nice to have and would be appreciated. The Five Minute Journal – Create a happier team with this simple gratitude journal. Teams don’t get shown appreciation frequently enough. When I asked a friend for gift ideas for this list, he looked at me blankly, then said, “I’ve never worked on a team where that happened. I don’t even know what that would look like.” I was shocked. Everyone wants to feel appreciated. Taking the time to let others know, even with a simple “thank you” with words shows you’ve noticed and care enough to say so. I’ve prepared a downloadable list for you to keep handy to make saying “thank you” easy. Just fill in the form below to have it sent straight to your inbox! Wonderful ideas to show appreciation! I will definitely try some of these out with my team members. Gratitude really is something that we can all focus on. Great, Jennifer! I’ve always loved being on both the receiving and giving ends. When the management took the time to host a potluck or cookout, etc. 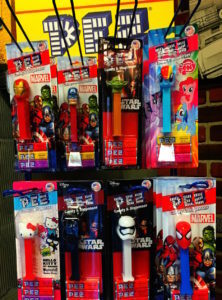 the team always appreciated it, and it was great for morale. And it’s so much fun to see the look of appreciation from my project teams when I demonstrate appreciation for them.